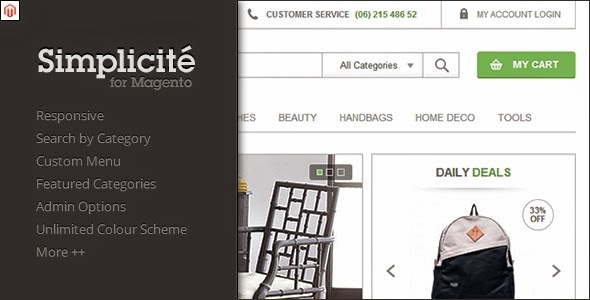 Simplicité Responsive Magento Theme can be used for any kind of Magento online store. It is packed with some useful features. Responsive, Search by Category, Featured Categories etc. 1. Custom Category Menu. You can add HTML, Videos, Plain Text or list of Products from the category in the menu. Configured from the category page in the admin area. 2. Slideshow with unlimited number of slides, uploaded from the admin panel. 4. Bestsellers and Latest Products Carousel. Admin Options available to limit the number of products and carousel slide. 6. Bestsellers and Latest Products Carousel. Admin Options available to limit the number of products and carousel slide. 7. Unlimited Color Scheme. Change the color scheme easily from the admin options. 11. Custom Tab on Product Page. 14. Homepage Design included for your customization needs. 15. Well Documented and Easy to Setup. 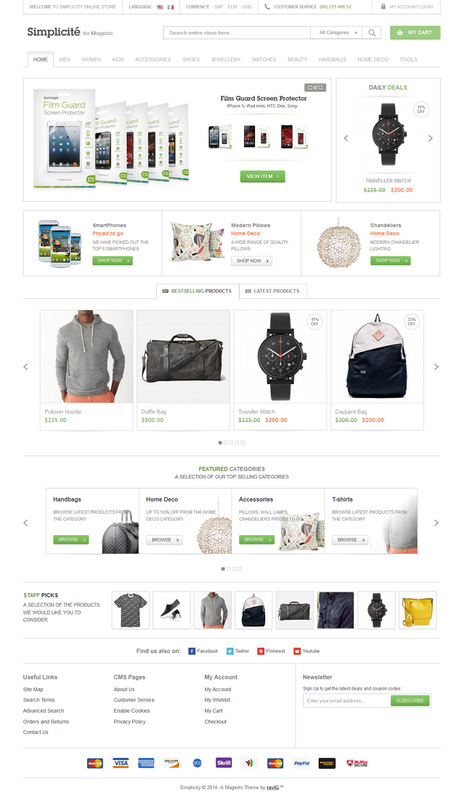 Item Reviewed: Simplicite New Responsive Magento Theme 9 out of 10 based on 10 ratings. 9 user reviews.